Is Gold Brook bridge haunted? The history of Gold Brook bridge is quite boring im afraid. I normally like to include a little bit of interesting history about the places i cover related to their hauntings, but this one is quite basic. It is simply just a small bridge with a covering which runs over Gold Brook for people and cars to cross over. Also known as Stowe hallow bridge or Emily's bridge after the popular ghost story, it was built in 1844, and added to the National register of historic places in 1974 and is still standing strong and in regular use. 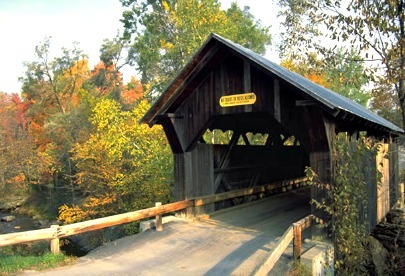 Emily's bridge isn't thought to be one of the most haunted places in Vermont, but it is probably the most well know. The story of the bridge being haunted is thought to have been started in the late 1950's or early 60's. It was first made public by a high school journalist who heard the story and featured it in her high schools paper. Emily is thought to have hung herself on the bridge after a huge row with her father, who didn't approve of the man she was seeing. She arranged to meet him at the bridge before running away together and starting a new life, but when the time came to meet her partner wasn't there and fearing he had changed his mind and left her she hung herself from a rafter. The next version says Emily was killed on the bridge by horses, though this version has split into two. One says it was her own horse who got spooked on the bridge and flung Emily from its back, with her dying instantly in the fall. The other version of this claims a pack of run away horses bolted across the bridge when she was on it, trampling her to death. The last common tale of her demise is said to be because her father made things very difficult for Emily and her boyfriend. He never approved of them being together and after she fell pregnant he demanded they get married. For whatever reason this led him to hang himself on the bridge and after Emily gave birth to two children she hung herself on the bridge to. It is very likely that the original story will never be known, or if the manifestation is even that of Emily as there is no proof of any of the deaths. A near by grave does have the name of Emily on it who died around the time the story would have started to spread, but it isn't an uncommon name and more than likely a coincidence. Which story if any have truth in them seems to never be known, but the number of reports of paranormal activity from this bridge cannot be ignored. The most common claims to come from this place include that of a violent ghost as people have said they have been scratched or pushed by an unseen force. Also cars which have stopped on Gold Brook bridge have heard noises on the roof such as banging or something being dragged over it. A number of unexplainable noises have been heard here, with anything from a girl screaming to footsteps coming across the empty bridge. Noises such as ropes tightening and vehicles being hit from the outside when in the middle of the bridge are also commonly heard. There have been a huge number of people who claim to have experienced something paranormal here, but since there is no solid evidence of the death of Emily on the bridge, and considering the nature of local spooky stories such as this it is likely people have blown the whole tale out of proportion. But then again, if you yourself experience something like a scratch on the arm from an invisible force it may just convince you there really is a reason to run in fear from Gold Brook bridge, as so many have done before.